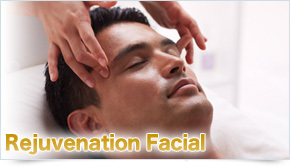 Our Facial Care Course features a variety of services. Through counseling, we cater to each customer's wishes and requests to propose the most appropriate method. Leads to the elimination of wrinkles with the ultimate in aging care. Skin's volume is increased from deep within! Draws out the skin's natural beauty to give you a youthful complexion! It promotes the stimulation of muscle and skin cells deep within the skin by a rhythmic full hand massage. Skin's primary functions of resilience and elasticity are promptly restored. Leads to a vibrant and clear complexion free of wrinkles and sagginess. This massage stimulates the facial pressure points of the internal organs. 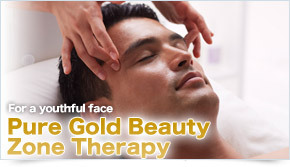 Using gold cream that contains 24 karat gold, this massage supports raising the vitality of the skin. It is said that gold has effects and ability to promote active movement. We aim to reduce skin troubles such as age spots, freckles, and dullness. By using electrical stimulation to apply an undiluted beauty solution, provides stimulation to the aging facial muscles. 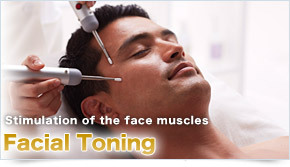 Aims to train the facial muscles around the eyes, forehead, etc.